Ireland face a must-win game against the UAE in Harare on Monoday to keep alive their World Cup hopes after a 52-run loss to the West Indies on Saturday. It could and indeed should have been a win for the Irish, but they spurned three opportunities which cost them dearly. Winning the toss Tim Murtagh (4-41) exploited the helpful conditions dismissing both Chris Gayle and Marlon Samuels cheaply as Ireland had the two-times world champions in early strife. Boyd Rankin had accounted for the dangerous Evin Lewis, while spinner Andy McBrine – preferred to seamer Barry McCarthy – removed Shai Hope and Shimron Heymyer (36). The scoreboard at that point read 83 for 5, but in the next 30 minutes Ireland let their opponents off the hook. Paul Stirling dropped a return catch from Jason Holder on 17, while the Windies skipper had another reprieve as George Dockrell failed to collect a Kevin O’Brien throw when he had made 33. The big chance though came when Rovman Powell skied George Dockrell on 18, and Gary Wilson - winning his 250th cap - failed to hold on to the chance after making great ground to get to the ball running back at mid-off. You got the sense that those misses would prove crucial and that was how the game panned out. Powell and Holder added 86 in a sixth wicket stand, before Powell dominated the final phase of the innings with some powerful blows. Having taken 77 balls to reach 50, he took just another 22 to reach his maiden ODI century, striking 7 sixes as he dominated an 8th wicket stand of 70 in just six overs with Ashley Nurse, as Ireland’s lack of death bowling expertise was once again cruelly exposed. Kevin O’Brien taking the brunt of the assault, conceding 66 runs from his eight overs. A final West Indies total of 257 was challenging, but Ireland would have fancied their chances at the half-way stage. However, skipper William Porterfield fell for 0 in the second over to Jason Holder, and was quickly followed by Paul Stirling (18) and Andrew Balbirnie – both falling to the impressive Kemar Roach (4-27). Ed Joyce made his 29th half century for Ireland sharing stands of 64 and 70 with Niall and Kevin O’Brien to get Ireland back into contention. Ireland had edged ahead on DLS for the first time in the innings at 166 for 4, needing 92 from 14 overs before disaster struck. Roach had Joyce (63) well caught at midwicket and three balls later got a fortunate lbw verdict against Kevin O’Brien (38). That double blow left the Irish reeling, and although Gary Wilson (18) and George Dockrell (14) added 31 for the 7th wicket, the required rate was increasing. 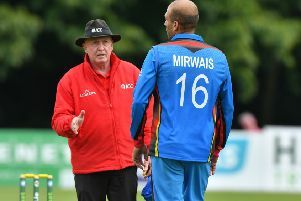 Scoreboard pressure led to increased risks and Kesrick Williams (4-43) mopped up the innings with excellent death bowling as four wickets fell for just seven to leave the Irish 205 all out – the 52-run margin harmful to their NRR standing. Indeed if Ireland were to lose to the UAE and The Netherlands beat West Indies, they may not even make the Super Six stage. A rueful Porterfield reflected afterwards: “We seemed in a good position, but we didn’t take some of our chances which can cost you in big games. “Those are the things you need, both the luck and to take your opportunities to win these types of games.